GDP wise Bangladesh is the 33th largest economy of the world. It is the 2nd largest Garments producer of the world. Certainly, the country has made its name as Emerging Tiger in South East Asia which is contributing to developing all related service industries which include Shipping, Freight Forwarding, Commercial Banking and also Legal service industries. Smooth Commercial Transaction and International Trade require strong legal support. Conducting due diligence on VAT, Tax, Custom related matters, deciding HS Codes and valuation, determining terms and conditions of the Sales contract or Pro-forma Invoices, Bill of Lading, seeking compliance with local and international foreign exchange control regulation, international trade law, determining suitable INCOTERMS, UCP 600 etc are only few areas where prudent client takes legal advice. Determining applicable HS codes and valuation based on the nature of import and export is the key to avoiding potential dispute and unwanted claim from Tax authorities. Besides, consistency and coherence of different terms in several commercial documents also significantly help clients in case of disputes involving cargo payment and delivery. 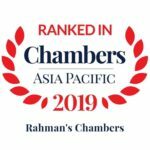 Rahman’s Chambers has been ranked for “Corporate and Finance” & “Shipping”. Rahman’s Chambers has strong contentious capabilities and has handled a number of insurance, fraud and international trade disputes. We, as one of the Leading Law Firms, are advising and representing Clients on several international and local commercial matters for nearly a decade. Rahman’s Chambers is a full-service law firm for all trade-related matters. Besides dealing with Commercial Litigation matters, the firm provides all sorts of support to the business community over trade-related issues for both local and foreign clients. We have advised Maersk Bangladesh Limited and also A.P. Moller –Maersk, Denmark by preparing templates for Letter of indemnity suitable for Bangladesh and also other jurisdiction, for example, India, Pakistan where there is exchange control regulation. We have advised G.A.B Limited, a concern of Gildan Active-wear Bangladesh and a Multi-National Company on different custom formalities involving bonded warehouse matters allowing exemption from import duty for 100% export oriented import and extension of a bonded area in different locations. We have conducted due diligence over VAT, Tax, Customs duties for Sojitz Machinery Corporation, a sogo shosha (General Trading Companies)based in Tokyo, Japan regarding the import of Gantry Crane for Chittagong Port authority. We have advised a leading Chinese construction company regarding foreign vessel registration process in Bangladesh, local acceptability of China classification society and applicable cost/ tax breakdown etc. We have advised and provided due diligence report to Dharti Dredging and Infrastructure Limited, India on the importation of dredgers as capital machinery and applicable customs duty, foreign vessel registration process and applicable registration fees in Bangladesh, setting up dredging business in Bangladesh etc. We have advised a major South Korean construction company and provided due diligence report on applicable customs duty, supplementary duty, advance trade VAT, advance income tax on several types of equipment, i.e. cranes, bulldozers, generators, pile drivers and extractors etc. We have provided legal consultancy service to one of the leading LPG provider company in Bangladesh regarding autogas supply agreement related matters. We have assisted First Northeast Electric Power Engineering Co. (NEPC) in the conversion of temporarily imported equipment into permanent importation from a project to a subsidiary company as capital machinery subject to availing significant exemption on applicable duty and tax. We have conducted due diligence for Samsung Engineering Company Limited of South Korea on several trade-related issues involving Bangladesh. We have vetted and drafted Sales contract and Pro-forma Invoices for several Garments and Textiles, for example, Saturn Textiles Limited, How Are You Textiles Limited etc. We have advised a major construction and engineering company from China named First Northeast Electric Power Engineering Co. (NEPC) on converting temporary import of equipment into permanent imports. We have advised Maersk Bangladesh Limited regarding terminal handling charges related regulation, rules, the policy of Chattogram Port Authority. We have vetted trade documents and LC documents for several Bank and Financial Institutions such as Dutch-Bangla Bank Limited, First Security Islami Bank Limited etc. We provide specialized services including drafting several commercial contracts with different stakeholders, review of various commercial documents & contracts to ascertain whether they are legally valid, protection of legal rights and business interests, the inclusion of favorable terms etc which eventually becomes useful if any dispute arises out of any such commercial contracts or documents. The firm regularly advises both bankers and businessman on matters related to LC, DA, DP etc. We have specialized knowledge & experience on foreign exchange guidance, UCP600, and INCOTERMS 2010 etc. The firm provides specialized services including drafting Sales contract and Proforma Invoices etc. Adding useful terms and conditions in sales contract have been proved valuable if the matter goes to court due to the lengthy process of recovery in Bangladesh. Over the years, we have advised several carriers, banks, buyers, and sellers on issues related to Bill of Lading, Charter party, Indemnity, etc. Our expertise in carriage law is clearly evident from the reported landmark decision as reported on Freight Management and 16 others vs Bangladesh Bank 2 CLR (HCD) 586; 19 MLR (HCD) 336. In recent years, we have advised Maersk Line, Denmark & Bangladesh in preparing indemnity letters, contracts with shippers, etc. The firm has in depth knowledge & experience in dealing with freight forwarding and C & F related issues. Our clients found it critical and very useful once they received advice from us while dealing with these matters. The landmark case Freight Management and 16 others vs Bangladesh Bank reported in 2 CLR (HCD) 586; 19 MLR (HCD)336 where the firm has successfully argued before Hon’ble court on the roles of freight forwarder and carrier under existing laws is a testimony of the firm’s ability. We provide due diligence report to our client on trade-related tax, vat and customs issues so that they can plan even before commencing trade. Clients often take our assistance in calculating applicable customs duty, source tax and advance trade VAT based on different HS Codes. Our due diligence report varies depending on several issues, e.g. the nature of import and export, the nature of the business sector, applicable exemption etc. Further details in this regard are available in our respective practice area of “VAT, Tax and Customs Matters”. The central bank custom houses under National Board of Revenue (NBR), port authorities under Department of Shipping operate under several laws, SRO, circulars, regulations, on which the firm has gathered its experience and expertise. LC Fraud (Hallmark case): Alvi Spinning Mills Ltd and others vs Govt. of Bangladesh. International Trade: Freight Management vs. Bangladesh Bank. Admiralty & Maritime: Marodi Services vs MV Swift Co.